I have been using Nike+ to record my runs since May 2013. It has served me well and been a fantastic motivational source to record my runs, engage in challenges with fellow runners and achieve those ‘trophies’ for completing certain milestones. Why have I now decided to leave Nike+ for another piece of software called Strava? Well, it all started last week when I was searching for an app to help record cycling. I have signed up for the London Duathlon (September 2015) and need to get some bike training underway. I came across an app called Strava, not having heard of it before. I was intrigued to learn that it can record not only biking activities, but also running! (and a number of other activities). With great curiosity, I downloaded the app and made an account. I was even more excited to see the desktop version! 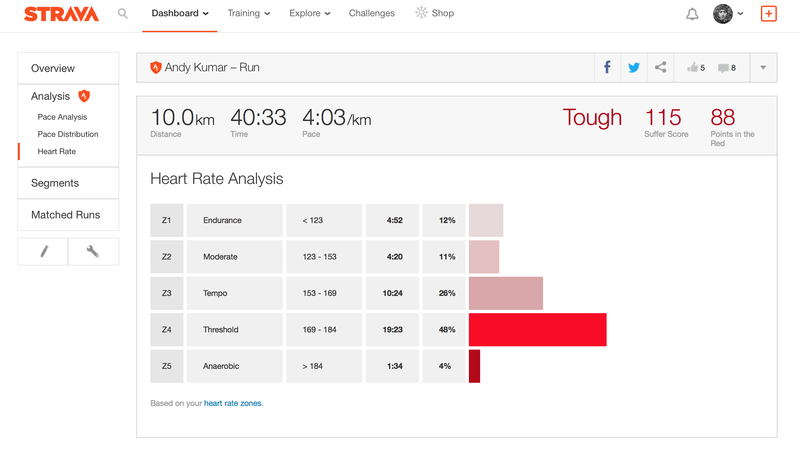 The Strava dashboard is a huge improvement over the Nike+ dashboard. 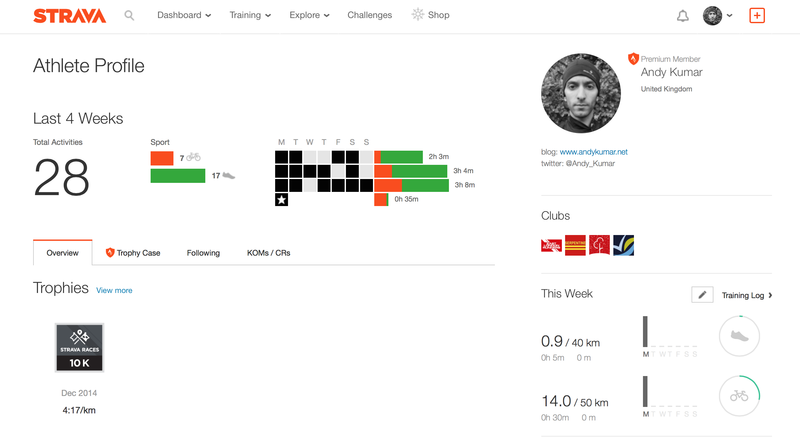 I was really impressed to see all my run data available at a glance, activities, time spent training and weekly target goals for both running and cycling. Furthermore, the flat design and easy navigation were the icing on the cake. But looks are (almost) nothing without deep and intuitive features. Fortunately, Strava delivers. I think the list could go on a little further, but will stop there. A special mention still must be made of the race analysis. Allowing one to view a breakdown of their race, complete with km breakdowns, splits and time differences. 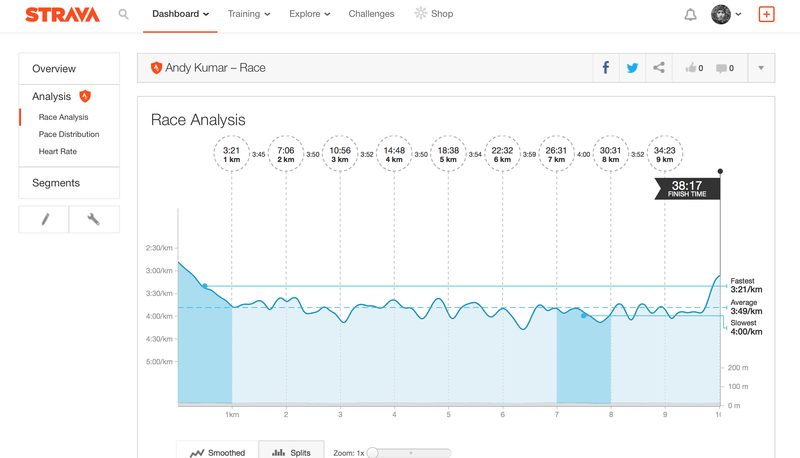 The option to then view other Strava runners (friends or not) and compare your race times is immensely useful. I have often been critical of the Nike+ software. Although very helpful to the unsuspecting, new runner, it leaves a lot to be desired for a more keen athlete. Anecdotally speaking, I have seen more experienced runners with more powerful tools to record their runs, such as HR sensors and Garmin-style watches. Having now had the opportunity to venture into this market, I picked up a Tom Tom Multi-sport GPS watch (review to follow). This is again a point where Strava excels. Runs can be uploaded from watches designed by a number of manufacturers, providing the athlete with greater freedom over their choice of running gadgets. This leads me onto my next point; heart rate (HR) analysis! I had never paid much attention to my heart rate distribution through my runs, and would often judge pace according to how I felt. Now trying to break a 3-hour marathon, I have begun to take a far more scientific approach to my training. Lactate threshold training is a must for any keen runner, and using a HR monitor allows me to judge exactly how ‘hard’ I am running. Of course, such measurements will not be blindly followed and one must still listen to how they feel, too! Conclusively, I feel that Strava is the way all running applications/software should be devised. Clean, sleek, functional and intuitive. randomly came across your website. you should use ismoothrun! it posts to whatever platform you want. I have it, and mine posts to Strava, Nike+, Garmin Connect and Runkeeper. i think their GPS tracking is better than the other apps. the app is not free though, but £4.99 for a one-time payment is not bad.